Are your email marketing strategies missing the mark? Maybe the puns in your subject lines aren’t landing or your customers are glancing over them altogether? In Cut the B.S. with Shawn Episode 5, Shawn shares how you can still win with emails. Don’t get discouraged about your emails. After all, you’re trying to engage with people the same way their personal contacts are, so you can’t expect to be VIP on their list. Instead, try some of these tactics—like treating THEM like a VIP—and maybe you can become one of their favorites. Drive home the deals, in store. Are your customers expecting to find great deals in your emails? Maybe shoppers aren’t opening your emails because they’ve chalked them up to another hollow retail email with nothing good inside. Everybody wants to feel special. Encourage customers to sign up for your emails so they can receive exclusive offers and discounts they won’t be able to find elsewhere. 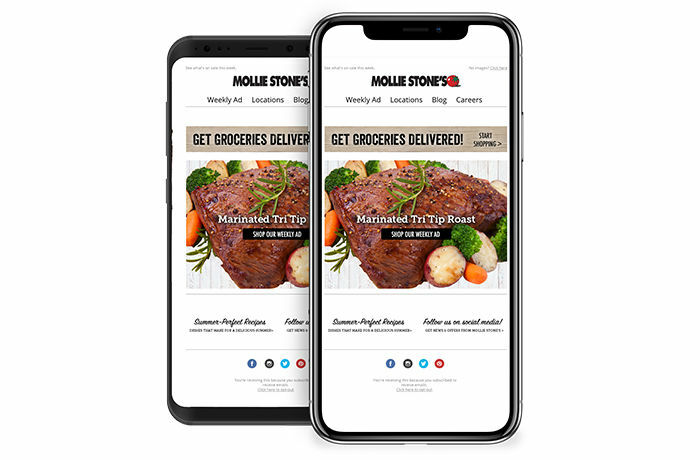 You can also use push notifications as a way to send out deals, and leverage email as a way for shoppers to access exclusive content, like recipes, videos and more. Did you know that you can update the content of an email even after it’s been sent? This is a game-changer. Dynamic emails allow you to update content (offers, expiration dates, etc.) within an email. This is perfect for creating demand with time-sensitive content. For those who haven’t opened an email with a previous offer, you can update their unread email with a brand new offer so deals stay relevant. How do you appeal to your customers with personalization? Learn more about personalization here.